As we watch kitties climb and play, it’s not hard to imagine how similar they might be to larger cats roaming in the wild. Our feline friends constantly impress us with their agility and cleverness, showcasing natural physique matched with superior intelligence. We see evidence of their ancestry in many ways, but you’d be surprised just how much your furball has in common with wild lions wandering the Savannah. Humans have been living alongside cats for thousands of years, tracing their origins back to early days of civilization. 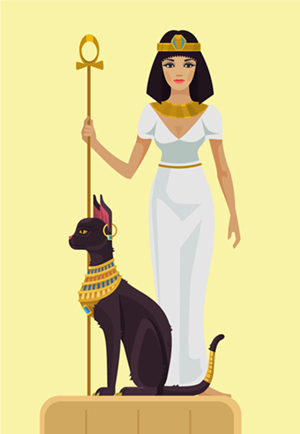 In-depth genetic testing shows our relationships with cats began during the early farming years of the Fertile Crescent. Unlike other farm animals, feline ancestors won their homes more with charm than utility. Unsurprisingly, these cats became domesticated by gracefully inviting themselves in with purr-suasion and cat-itude. 1. Autonomy and Physiology Amazingly, both wild and domestic cats share the same dental, skeletal, and circulatory structures. Domestic cats have the same number and placement of incisor, canine, molar, and premolar teeth. All cats also have the same 230 bones, including the same 30 spinal vertebrae; plus, their circulatory organs (heart, lungs, veins, and arteries) are similar in both function and structure. Preservation specialists in big cat sanctuaries have noted that there’s actually very little physiological difference between wild and domestic cats, especially looking at the bones. 2. Super Sleepy Kitties are known to sleep most of the time. Nearly half of a cat’s life is spent sleeping but few pet parents know why. All cats sleep roughly12-16 hours a day. Whether big or small, all cats use sleep to help conserve energy. Larger cats have a sleep cycle, known as feed-rest-hunt, that helps them compensate for less bountiful days. Lions and tigers can actually rest up to 20 hours a day, depending on their last meal. 3. Paws and Claws Anatomically speaking, domestic cats are extremely similar to their larger cousins. Aside from size, most cats use their paws and claws in many of the same ways. Sharp claws give cats the traction needed to run quickly and climb easily while also serving as their main line of defense. Cats scratch their surroundings, not only to sharpen claws, but also to further establish territory by using the scent glands in their paws (mentioned below). Wildcats are often seen sharpening their claws on tress much like your own feline friend. 4. 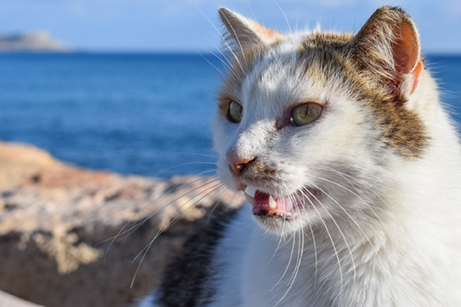 Mouth Breathers You’ve probably noticed your cat open-mouth breathing outside or around something new. Some may confuse this as a sign of aggression or overheating but it actually helps them smell. Cats have an impressive sense of smell that’s exponentially stronger than any humans. This is due to an additional olfactory organ, called the Jacobson’s organ, that’s commonly found in numerous wildlife species. Animals with this organ can open their mouth, wrinkle their nose, and pause breathing to taste-smell the environment. You can see countless fun images of this famed kitty “stink face”. 5. Rubbing Against Everything Interestingly all cats, big or small, do this! Every cat has a collection of scent glands on the sides of their face, near the mouth, on the front paws, and at the base of their tail. These glands release pheromones that cats use to mark their environment, helping them track pack members and further establish territory. Tigers and lions can be seen bumping their heads on trees and rocks to warn others of their presence while looking completely adorable. When domestic cats rub against something, they are simply letting the world know what belongs to them. By rubbing against you, you have become both packmate and property. 6. Clean Kitties Cats are naturally clean creatures that groom themselves and their young daily. While domestic cats may seem more hygienic due to their indoor lifestyles, realistically wild cats have all the same hygiene practices. Amazingly, both wild and domestic cats spend 30-50% of their waking life bathing themselves! 7. Naturally Playful Cats are naturally curious and playful creatures. Although tigers aren’t typically found batting around stuffed mice or puff balls, you’d be surprised how much fun they can have with a big cardboard box or a roll of toilet paper. Interestingly, researchers have also noticed a strong, similar reaction to catnip with videos of wildcats rolling and rubbing playfully wherever catnip is left. No matter how intimidating a wildcat may seem, they make messes and play with random things, like any other kitty. 8. Night Stalkers Cats are notoriously known for their sleek stealth and preference for night adventuring. This is directly related to all feline’s excellent night vision. Veterinarians commonly attribute this ability to the tapetum lucidum, a structure in cat’s eyes which acts as a mirror that reflects light into the eye. A cat’s eye is able to mirror all light and reflection to help them see in dim settings. This impressive ocular feature allows a cat to combine agility with superior night vision to stalk prey during dusk, dawn, and darkness. 9. Sly Hunters Whether its bugs or small animals, your domestic kitty is a precious killing machine. Although many pet parents have received little “gifts”, few every consider what it takes to win that “trophy”. Results from research indicates that housecats kill anywhere from 100-350 million birds per year, including feral cats. The average housecat hunts with equal precision to their wild ancestors, hunting more on biological instinct than survivalist need. Your kitty brings you the rewards of their hunt much like lion brings home food for their pride. 10. Carnivorous Diet Although the diet of a wildcat versus a housecat are extremely different, they have one thing in common: meat. Although wild cats, such a cougars or mountain lions, hunt anything from large to small mammals, many supplement their diet with rodents and even grasshoppers. 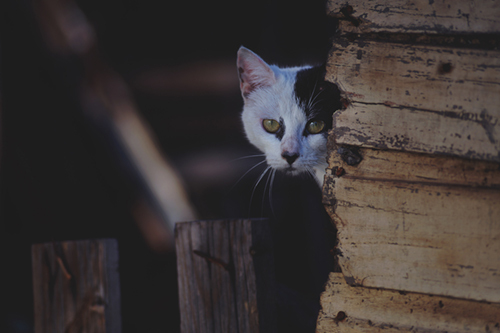 Housecats benefit from a more diverse diet but their health depends on access to lots of quality animal-based protein. This fact alone can help pet parents understand the importance of avoiding pet food with grainy fillers. What Big Cat is Your Pet Most Like? Ever wonder what kind of wild cat is living inside of your house cat? Do you have a little Tiger, Leopard, Cheetah or Lion? Take a few minutes to answer some questions on our Little Big Cats survey to find your cat’s wild side! IRONMAN champion Kelly Williamson shares the story of how Amico, her 3-legged Australian cattle dog, came into their lives (and became a part of their fitness routines).